Happy Friday and welcome to my first posting as DT member for Simply Create Too challenge blog! 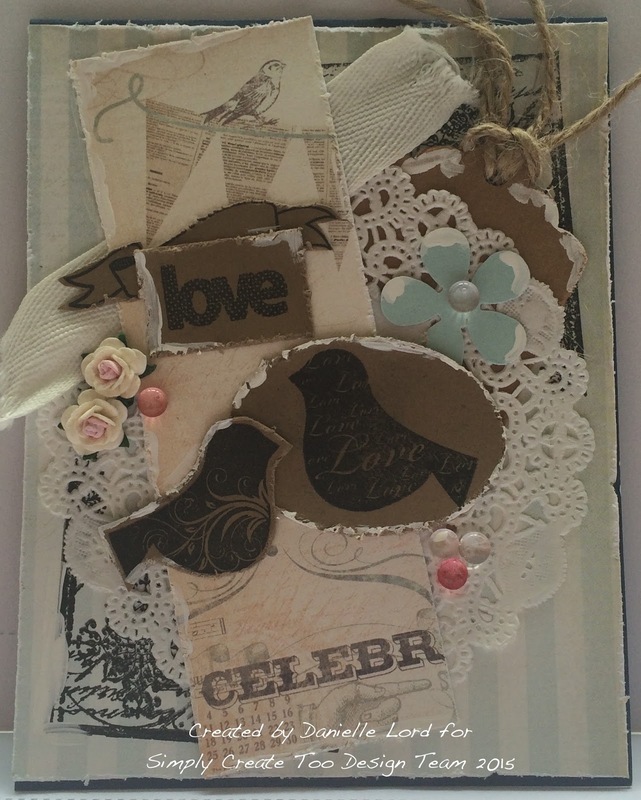 I am excited today to be showing you my vintage/shabby chic creation for today's challenge. I hope you are able to pop on over and join in! I used an adorable set of stamps from Maya Road for this card - aren't those birds just the cutest! I added gesso around the edges of the card and papers to give some extra shabby chic style! The embellishments are all from my stash. I hope you enjoy my card today and if you are feeling vintage/shabby chic creative be sure to link up your card to the Simply Create challenge here. Thanks for stopping in today. I'm heading up to Canada today for the next two weeks - the boys finish up school and we have a wedding to attend next weekend! I get to hang out with my girlfriends for the next couple of weeks - so excited!! Until next time ... happy crafting!! Absolutely gorgeous shabby chic card, Danielle, a warm welcome to the team!